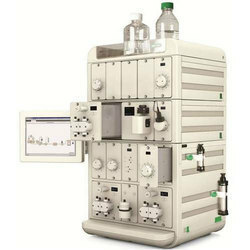 Bio-Rad's extensive product line includes a full selection of chromatography instruments, columns, and media, including ion-exchange, affinity, hydrophobic interaction, and size-exclusion chromatography media. The C-96 Autosampler and the BioFrac™ and Model 2110 Fraction Collectors are designed for use with the NGC™, BioLogic DuoFlow™, and other liquid chromatography systems. Bio-Rad supplies cables for linking chromatography components, high-, medium-, and low-pressure fittings for liquid connections, and several types of tubing for liquid chromatography applications. The family of NGC Medium-Pressure Chromatography Systems fit your throughput requirements when purifying biomolecules for analytical- and preparative-scale applications. Each system is composed of interchangeable modules that confer different system capabilities. For an overview of the features and capabilities of the six NGC Chromatography Systems, view the NGC 100 System comparison chart and watch the NGC System Tour. The NGC Systems are composed of interchangeable modules that confer different system capabilities. Browse the module selection guide to help you decide which system is best for you, or use our online tool to configure your personalized NGC Instrument.